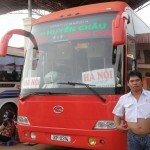 So it turns out that getting the bus from Vienttiane to Hanoi is the most horrible thing you can ever do. If you are considering it, don’t! Yes, its cheap, but honestly just don’t do it. 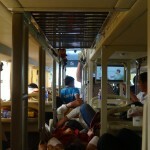 We had the worst seats on the bus, at the back; above the engine and next to the toilet. Was incredibly hot and claustrophobic. Crossing the boarder was quite funny. Partly as they still seem to be building it. It was quite upsetting seeing the busses with luggage compartments full of caged animals including cats and dogs destined for the pot. 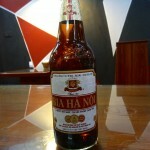 Anyway after 26 hours of traveling we finally made it to Hanoi. I would in no way do this journey again, but even so every journey is an adventure. Will just put this one down as “character building”. Think the time has come to wash our hair too. Experiment only lasted 11 days. I just like to be clean!